Again, this was a prototype, so all of the descriptions/images/details will likely change. The game is for 2 players, and plays in 15-30 minutes. Shuffle the 22 Island Tiles facedown and create four piles of 4, 5, 6, and 7 tiles. Then randomly add one of the four Zombie tiles to each of those piles. You’ll need to the Beach tile and the Explorer on the start space of the Beach tile. The Explorer takes turns until the first Zombie tile shows up. The Explorer can first move, any number of empty spaces, in a straight line–including diagonally. He can’t move through jungle, or a zombie. If the Explorer moves, then placing a tile is optional. If the Explorer doesn’t move, then he must place a tile. The placement of the tile will depend on where the Explorer is. 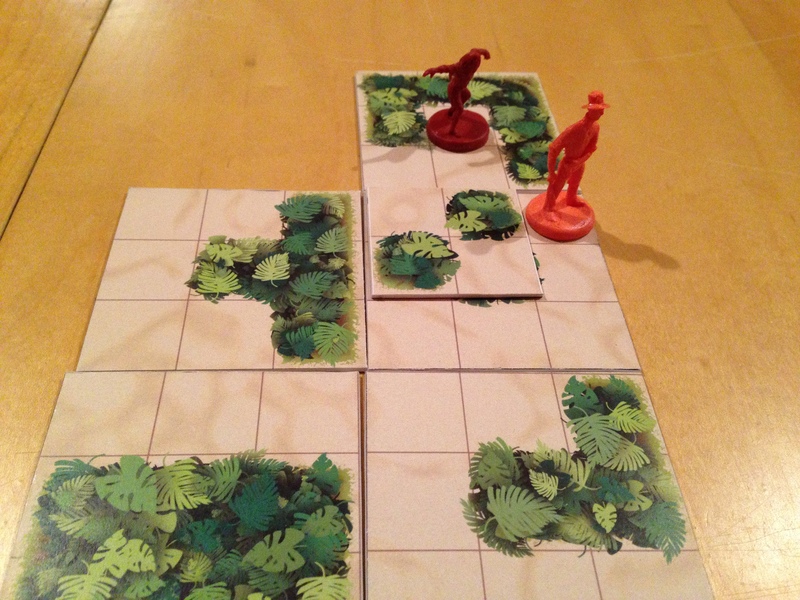 There are three spaces on each edge of a Jungle tile. If the Explorer is on the middle space, then the tile has to be placed on that side of the tile, but if the Explorer is on the top or bottom space, then the tile can go on that side, or above/below depending on where the Explorer is. If there’s a choice as to where it can go, the Explorer has to choose where the new tile will go before looking at it. Once you decide, you can rotate the tile. You have to place the tile such that you can get to at least one previously placed tile. If you draw a Zombie tile, you place the tile, draw a Machete tile, and place a Zombie figure on its side on the middle space of the tile. Machete tiles are 2×2 tiles that can help you get out of a scrape. You can play it as part of your movement, and it can create an escape path for your Explorer, or slow down a zombie. Once a zombie appears, then the other player can move them. First, he moves all active Zombies at least one space (if possible), and then Activates new Zombies that are one their side because they were just brought in. After the fourth Zombie appears, then the player controlling them has to roll a die, and you might have to lie a Zombie on its side, or remove it from the game. 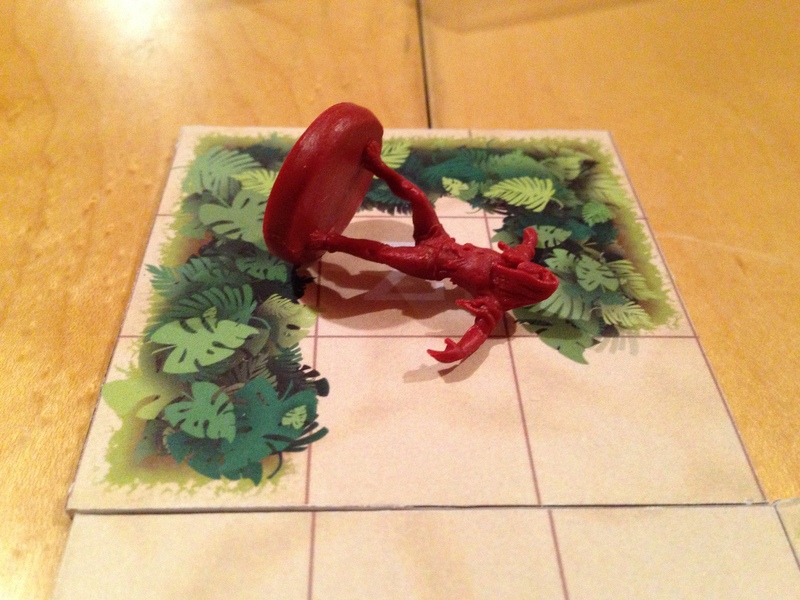 The Explorer wins if he places all of the Island tiles and returns to the Beach tile without getting caught, or if all of the Zombies are removed thanks to the die roll. The Zombie wins if a Zombie lands on the Explorer, or the Explorer moves onto a Zombie, or the Explorer can’t move, or he can’t reveal all Island tiles, or the Explorer returns to the Beach before placing all of the tiles. This was an interesting tile-laying game. I played with a fellow gamer, and then again with my 9-year-old. It was a quick filler for the gamer, but my son liked it a fair amount. He was thinking through where he should play tiles, and once the Zombies came out, you could see him working through how to use Machete tiles to help himself and hinder me. He also saw some ways that he misplayed some tiles. It was all a great exercise for him on making good decisions. It’s tricky, because you want to leave yourself with some options and easy outs, but since Zombies can move the same way as you–if not as far–you don’t want to leave it too wide open. There’s some luck when it comes to when a zombie comes out. Thanks to the distribution, you could get a Zombie on the last tile of one pile, and the first tile of the next pile. That would be rough. But it’s a short game. The only thing that felt a little “off” was the die that can cause you to “lose control” of your zombies. It’s obviously a check on the power of the Zombie player once all four are out, but it feels awfully artificial. I understand that you don’t want it to become impossible for the Explorer by the end, but it still feels game-y. I only played one mode of the game; I have no idea what the other modes entail. Overall, this was a good little tile-laying game. It’s not terribly complex, and won’t revolutionize the genre. But there are genuine decisions to be made, and I like that there are completely different goals for each side, rather than symmetrical gameplay, like so many abstracts. It reminds me a little of the old game Tally Ho in the sense that you’re each going for different goals using the same board. It’s not a brain-burner, but there’s some thinkiness to it. 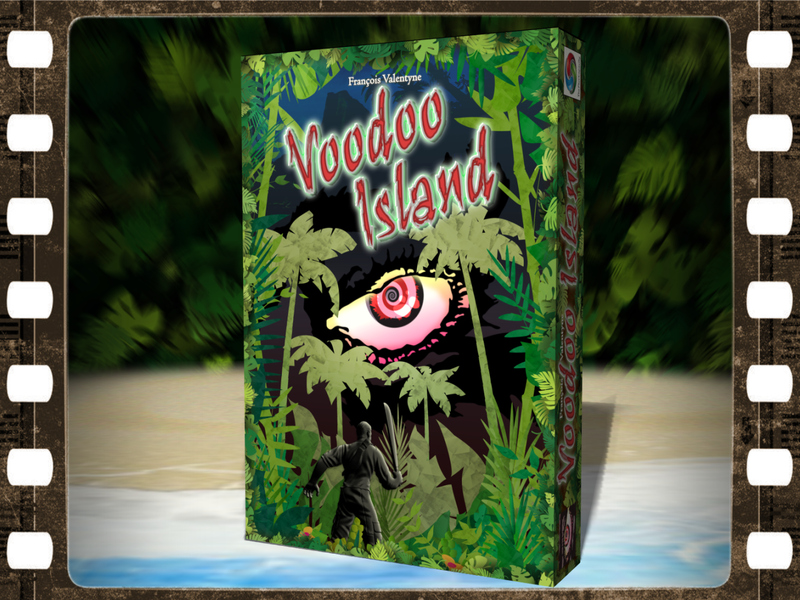 I enjoyed playing it, and you should consider checking out the just-launched Kickstarter to see what The Flux Capacity has in store for the rest of the game.